Kawalek and Hanten pose with their friends from the Gamma Phi Circus. Most students dream to build a career based on what they chose to major in during their time in college. Whether they study business, communications or performance arts, each student at Illinois State University strives toward eventually landing a dream job post-graduation. 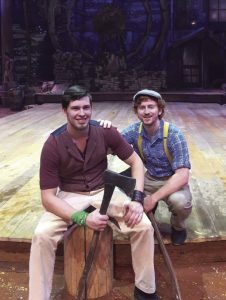 For 2016 graduate Thomas Kawalek and sophomore John Hanten, landing a dream job came unexpectedly when the two were cast in Dolly Parton’s Lumberjack Adventure Dinner & Show in Tennessee last semester. Both Kawalek and Hanten were performers in ISU’s Gamma Phi Circus when they heard the news that a talent scout interested in casting performers was going to stop by a practice to observe. “This was absolutely the career move I wanted to make, and when my assistant director for the Gamma Phi Circus at the time said there was a talent scout coming in to potentially cast for a new show, I jumped,” Kawalek said. It wasn’t the audition process that Kawalek or Hanten were used to, but regardless, both put in extreme effort that paid off in the long run when the two were cast for the show around January. Performers were picked for the skills they best-possessed as acrobats and started work on honing these talents for the show immediately. “After signing and sending electronic copies to our casting company, we were told what to work on while we finished out the end of the spring semester at Illinois State,” Kawalek said. Once graduation rolled around, he had to leave town almost as soon as he walked off the stage with his diploma. “The day after I walked at graduation my parents and I drove nine hours to Tennessee and I literally started working that night, getting my costume fitted and starting choreography,” Kawalek said. Once rehearsals took off, Kawalek and Hanten began working daily to prepare for the show, which has performances at least once a day since opening in May. Performers had the chance to show their skills to Dolly Parton herself, who watched the first performance. “It can prove to be hectic at times, but that’s what makes it a lot of fun and there is never a dull moment … I’m improving and learning new things every day,” Hanten, a musical theatre major, said. Both Kawalek and Hanten will be working at the show until at least the end of December, hoping to renew their contracts and stay performing for a full year. The two credit their time at ISU for giving them the experience they needed to successfully audition and perform in the show. “I certainly feel like my time at ISU helped me prepare for this because of the Gamma Phi Circus,” Hanten said. Both performers encourage students looking for a career in the performing arts to stick with the program even when the going gets tough, as the rewards can be beneficial and exciting. These former ISU students will perform in Dolly Parton’s Lumberjack Adventure Dinner & Show through December in Pigeon Forge, Tenn. This story first appeared in the Vidette.